On 10 January the Transport Committee of the European Parliament will hold a hugely important vote. Their agreement about the EU Mobility Package will have a major impact on bus and truck drivers’ work and rest schedules, on their wages, and on the safety of all road users in Europe. Ahead of this vote, the European Transport Workers’ Federation (ETF) calls on MEPs to keep the current EU rules on driving and rest time. Only this way can they guarantee safety and fair working conditions for millions of EU citizens. With EU elections coming up in May 2019 we’ll be sure to inform the public about how MEPs have voted. Will they choose safety and fair working conditions? The ETF and its affiliated trade unions across Europe demand that MEPs reject any reforms that mean longer driving times. 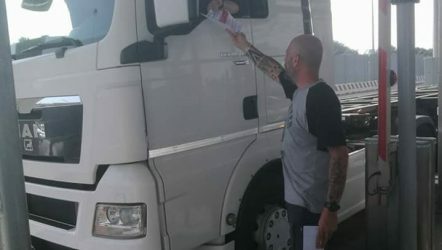 They must also reaffirm that drivers spend their long week-ends in adequate accommodation and not in vehicle cabins, and make it legally clear that drivers working abroad are paid the wages of the EU countries where they work. Check out our this video showing our actions across Europe this week.